Maintaining good hygiene is an important part of outdoor life. Being ill while camping or travelling is a very unpleasant ordeal, particularly if it involves vomiting or diarrhoea. 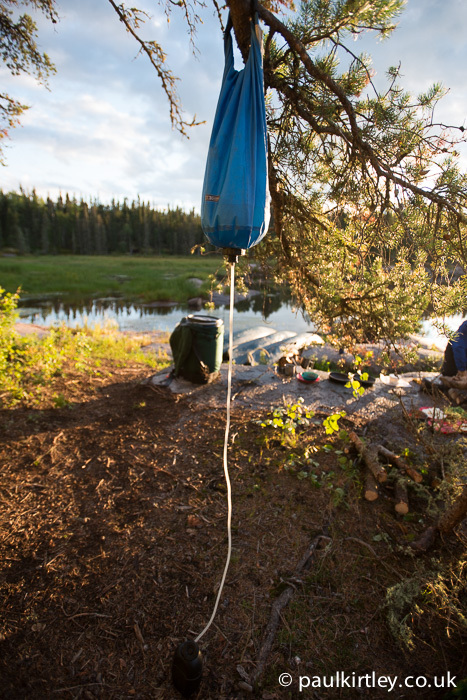 Good drinking water safety is a key part of staying free of stomach bugs while camping. Unless you are undertaking a solo trip, multiple people will be using the water-based facilities around camp. Therefore, in order to maintain good water safety discipline, there needs to be a system. The system should be explained to all parties in camp. Everyone needs to understand the system and everyone needs to stick to the system. In camping situations involving children and adults, some element of oversight or supervision may be required to ensure junior members of the party stick to the rules. Here are my six S’s of water safety in camp. If your camp follows these rules, you should all have a healthy, bug-free adventure. Water safety starts with the source. Ensure water is safe to drink in the first place, either by securing a clean source or treating water to make it potable. Potential pathogenic problems include protozoa, bacteria and viruses – but solutions can be found in the form of filtration, chemical sterilisation and boiling. Read more on the five water contaminants you need to know about. Segregate clean water from dirty water. 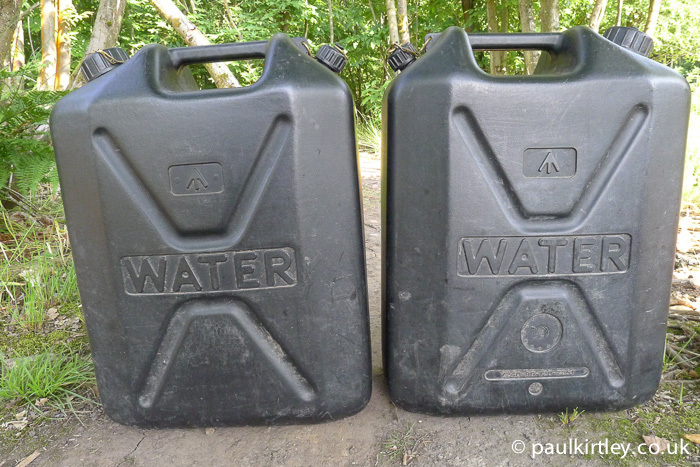 In camps, water is often stored in jerry cans or collapsible water bags. Whichever type you are using, it is generally best not to store clean water in the same type of container as you collect dirty water. An exception to this is if you’re using chemical sterilisation; here you’ll be adding the chemicals to collected water and allowing for the correct contact time to produce drinkable water – in the same container. In this case, I’d recommend a separate area for containers that are not yet ready, only releasing containers for general use when they have been treated. Untreated water should be stored separately and preferably supervised when young people are in camp. If you are sterilising water by boiling, pour visibly clean water into metal vessels, then bring to the boil. This process should always be supervised, with someone ensuring that each vessel comes to a rolling boil for several minutes before the water is decanted into a storage vessel. Take extra care with young people in camp – both when around boiling water and while storing hot water in containers. Allow storage containers to cool down in a safe place before putting them out for general use around camp. Keep your storage containers clean. Following this system should ensure you only ever have water that is safe to drink. Bugs, however, can be accidentally introduced to water after it’s been purified. This contamination is often caused when dirty hands come in contact with storage containers; particularly caps, nozzles and threads. Put procedures in place to prevent this. For example, pour water out into hand-washing basins before toilet visits; or get someone else to pour water for the visitor. Similarly, if someone has been handling raw meat or fish, they should not touch water containers until they’ve washed their hands thoroughly. Another cross-contamination culprit is bringing personal drinking bottles into direct contact with the openings of camp storage containers, thus passing bacteria from personal to group kit. Avoid such direct contact. People should not wash directly from camp storage containers, as there is potential for splashes into the containers. This includes pouring water on hands, feet, toothbrushes or face flannels. Use a separate basin or bucket if possible. 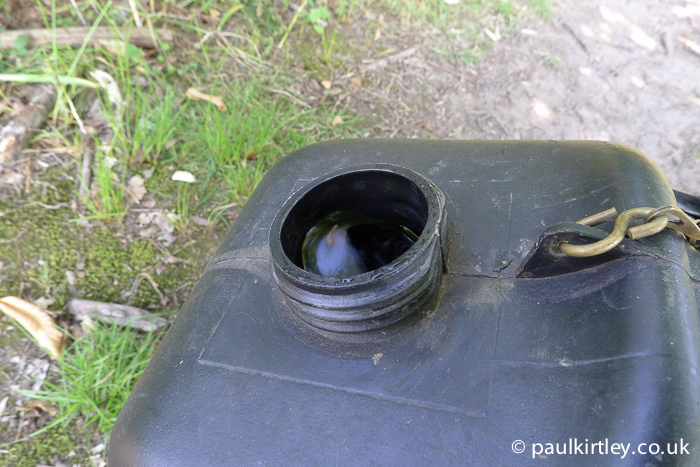 Finally, the tops of water containers should be replaced immediately after use. This minimises dirt, flies and other nasties getting into the water. It may not be the most fun part of planning a camp or venturing into the outdoors, but good water hygiene can make the difference between a camp to remember and one to forget! A version of this article was previously published in Scouting Magazine. This is a really interesting article. Full of obvious advice. Advice that most people just never consider. On a personal note, I use natural spring water, collected from the source once a week by myself, for all my drinking and cooking needs. I am sure the water from the spring is potable, but it all gets boiled before use when making cups of tea or cooking anyway. My washing and laundry needs are met by the stream that runs from the mountains behind me, collected with buckets and containerised. Again I have studied its course and I am confident that it has no chemical or heavy metal contaminants. It is also generally boiled for use. I do have mains water but the tap hardly ever gets touched so my last water bill was about 75p for the month. I do take care with cross contamination and the use of separate containers for separate tasks, however, I also feel that most people these days are much less tolerant of the bugs that are around us. The age of sterility, bleach and pharmaceuticals has left our immune systems lacking when faced with nature, “in my humble opinion”. I wonder what your opinion is on this? Obviously I am not advocating that people just stop using all the modern hygiene and sanitation products we have become dependent on. That would be a difficult if not disastrous transition to attempt. But I do think if done intelligently and over a sufficient period of time, we could all adapt back to the natural way. Providing of course we still apply our modern scientific understanding and accept the limitations imposed by the influence of the “modern world” around us. I think we humans are probably the weakest link when it comes to basic water safety/hygiene. Whilst not outside, I see on a regular basis poor hygiene used in shared facilities, in particular kitchens and toilets. This to me says this behaviour will most likely be carried on outside. It still amazes me in this day and age that some people still can’t get the basics right. I think as a society (or consumers as we are commonly referred to these days) we are constantly being told we must sterilise/clean in this way or that way with this product or that product when basic soap and water would probably do the trick (I release there may be ulterior motives here e.g. money for the seller). Even some washing powders are antibacterial these days. Anyhow getting back to your article. In a previous post there is mention of this being obvious advice, perhaps it is, sadly it is not always followed. I was thinking of a “Sawer mini” water filter, but in my area there are lots of pharmaceutical factories that have set up shop near the local rivers. Several have made the local paper for dumping used water (And all the chemicals) into the river, and the land further upstream is heavily farmed. So you can assume that chemicals from farming have entered the water supply! The filter says it filter down to “0.1 micron absolute”, according to their website. I have heard that it is sufficient for the little bugs that cause gut problems, but what about the chemicals in the water? They would be dissolved INTO the water, and not even boiling will remove them. Is there ANY way to lower the risk of chemical poisoning from what appears to be a good clean water source? Any advise would be gratefully receive as I am totally green when it comes to bushcraft things. Please keep up the good work, as the “Ask Paul Kirtly” show has opened my eyes to a lot of misconceptions I had on bushcraft. Kevin – add charcoal inline filter after Sawyer filter to filter out chemicals. Look at Platypus Gravity Works filter, and look at YouTube vids. An excellent article, as ever. Water hygiene is not obvious to people living in our culture because all you need to do is turn on a tap and put it in a glass or go to the supermarket and buy it, all the work has been done for you. The art of obtaining drinkable water has been removed from our daily lives, so expecting it to be obvious to people is the first mistake we can make. It’s just like any other lost skill- knife work, lighting a fire, looking people in the eye when speaking whole sentences, etc.- it needs a knowledgeable person to guide the beginner or trial, error and a lot of toilet paper. I am very grateful for all your knowledge sharing and I look forward to playing catch-up on the stuff I haven’t had time to read/watch over the last year. A bombproof safety code and camp water system/routine is great when everyone adheres to it but it can always be let down by dirty herberts and pongo’s. Look no further than a public toilet for proof of how others care little about the safety and hygiene of others. I’ve been in hospital toilets and witnessed medical staff coming out of the bog after taking a dump………… coming out and not washing their hands. I hope he wasnt a dentist…….lol……I’ve seen folks gut pheasants then go and play with the group water container for a drink without washing their hands………Then throw in the fact that intentional contamination can occur with serious repercussions. Too many variables for my liking……………..Even in a camp environment i prefer a personal autonomous system where everyone has their own containers to take care of themselves limiting the effect of problems affecting the whole group. Same goes for cooking……….one pot for all takes down the camp. Taking care of your own food and drink limits the issue of sickness. Its cool when youre working with or hanging out with folks you know and can trust not to be a dirty herbert but self reliance is the key in my eyes to eliminate most if not all camp hygiene/water issues. 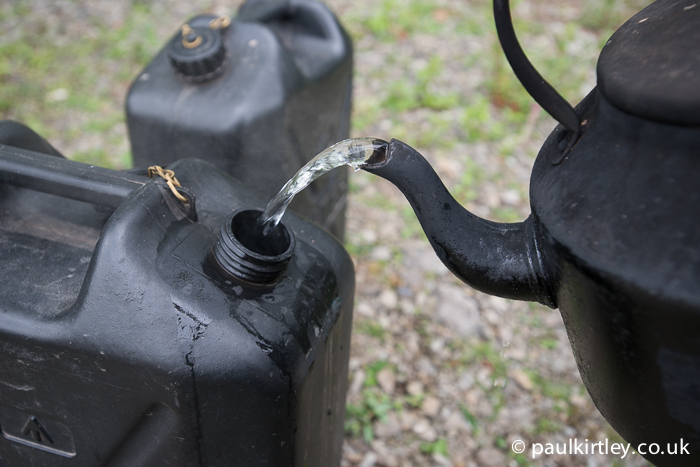 Serendipitous article: Last night I went through my collection of water purification kit. The question that bothered me later was chemical safety. Not industrial runoff, although that is a serious problem in some places. I bought surplus canvas water goats, er, bags from an outfit based in Nevada, US. Imagine you are in a desert environment, scrounging water from low spots and so forth. How do you know the water isn’t laced with arsenic or something? Extreme halide concentrations will be evident at the first sip but what about tasteless toxins? Membrane filters will filter out biological agents but not viruses or dissolved minerals or chemicals. Boiling will also kill biological pathogens. Purifiers using charcoal, iodine matrices, and certain electro-mechanical technologies will remove some of these viral hazards and non-biological pollutants. Distillation and reverse osmosis are the safest means of separating water from harmful biologicals and chemicals/minerals. Incidentally, the majority of gastrointestinal ailments suffered by outdoors enthusiasts is cause by poor personal hygiene, particularly dirty hands when handling consumables. Many germs and viruses can persist for some time on clothing and equipments, as well, especially if it remains damp. Thanks Paul for more useful pieces of information. 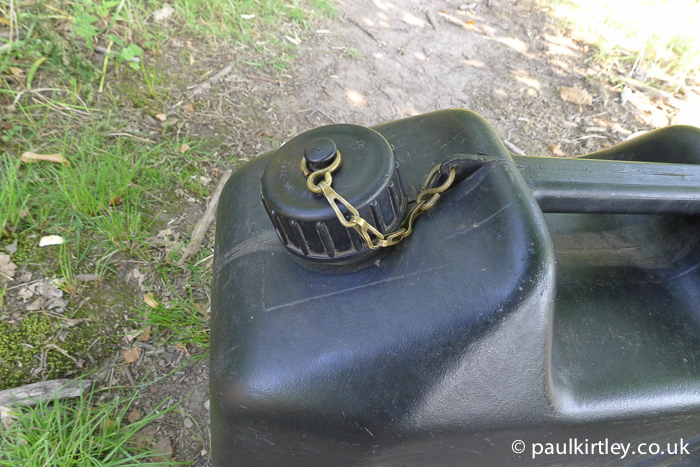 On the note of the tops of water containers getting contaminated, I noticed that the tops in the pictures were chained to the containers. very nasty infections lurk on the ground and in the soil. Just this simple method, of not letting the lid fall on the ground, deserves a mention in my opinion. The more that can be done simply, the better, especially with younger children around, when you need eyes “in the back of your head”. Keep safe, have fun,and please keep up the good work. All the best,Dave. I use a Millbank water filter to get the big stuff out then drop a chlorine tab in. if I’m making a brew then I normally don’t bother with the tab. Thanks, Paul. That’s great coming from this comment section, yes, I think natural spring is a good source of drinking water during camping. I think it’s better that you boil the water first before using it for cooking or quenching your thirst. I also agree with the post to separate clean drinking water with unclean water that is used for other purposes. The storage containers should always be clean and I think that those who handle them should always wash their hands. Nice read thanks for the information.